I just published my first book in the Transmigrant series. 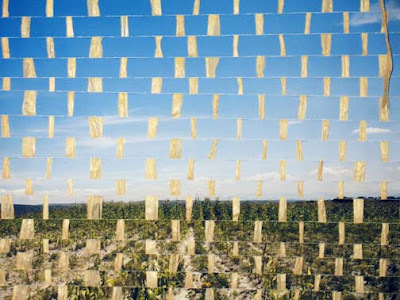 It is titled 'Transmigrant: weaving a new American landscape'. Please click below to check it out. Much thanks! Video about migration in Mexico. She answers questions about the changing culture in her small pueblo due to increased migration. A video about migration and how it affects the small towns in Mexico. 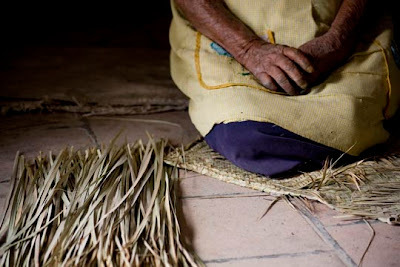 Weaving in Mexico is considered a form of art. It is ingrained in the society and revered for the talent it takes to master such a skill. I enjoy weaving and incorporate it in my work. 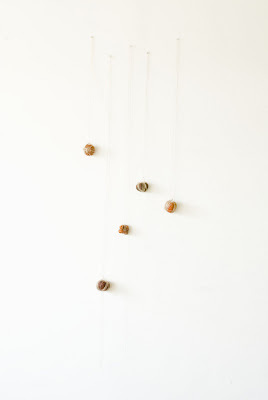 The notion of weaving symbolizes the integration of two separate cultures coming to together to make one. For Mexico and the U.S. this is the future. I want to convey the sense of intricate beauty and harmony that we experience when we take the time to admire our woven landscape of cultures. There you will be able to see a gallery of photographs taken by Mexican migrant workers documenting their travel from Ohio back to Morelia, Mexico. 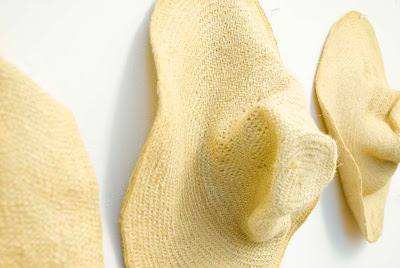 These pieces stem from my incurable fascination with the act of weaving. It was something I remember doing all the time when I was little. I would cut up anything I could and create something else, something new by combining the cuts. Before I traveled to Mexico I created some photographs that combined imagery. This was a technique I was using to illustrate the idea of two images becoming one. While in Mexico I became friends with a woman who made tortillas and woven rugs for men to take out to the fields when they went to work. She was amazing and had a spirit that radiated pride. She had hands that were beautiful. They showed the signs of age and of all the mats she has woven over the years. She took time to show me her skill and teach me in a patient way how to do it. She gave me gifts when I left, some hats and some material to practice with. 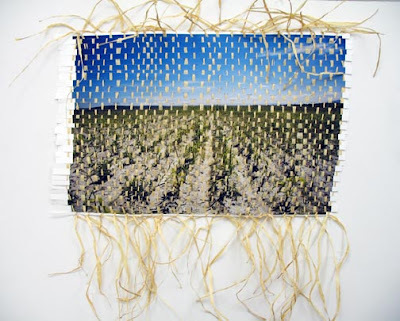 I took what she taught me to heart and I created a piece combining photography and raffia. 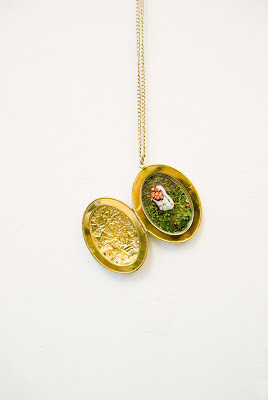 The intricately woven piece demonstrates the combining of worlds and of thoughts. The combination of culture. A cultural convergence is happening between Mexico and America. The combination of traditions and language is evident in every town from north to south. Weaving of culture and ideas is a way of visualizing the notion of transculturalism, the movement of culture over borders and over time. 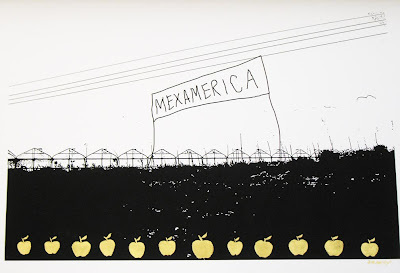 The origins of Mexican migrant customs in America lie in agriculture and manifest in the social and physical landscape of both nations. 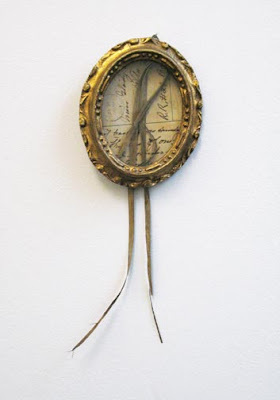 The resulting hybridity of cultures creates an intricate, woven layer in my mind. I live in a community where the nearest grocery store is a Mexican Super-Mart. There is a taqueria on the corner of my block and the landscapers who mow my lawn are all from Morelia, Mexico. 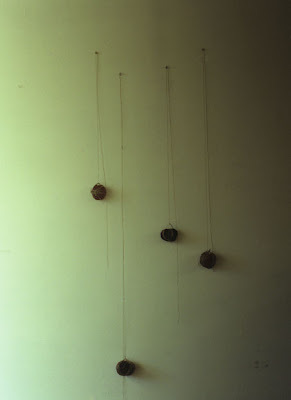 I have become an observer and participant of this weave of people and ideas resulting in a fluidity and resilience of cultural meaning that becomes imprinted on society through migratory immigrants from Mexico.  This series of work incorporates photographic and video imagery that represents social movement, exchange, migration and the subtle scenes of life weaving in and out of our consciousness. These images reveal the emerging cultural impacts of migrant workers in American and Mexican societies whileconsidering nationalism, territories, and belonging. 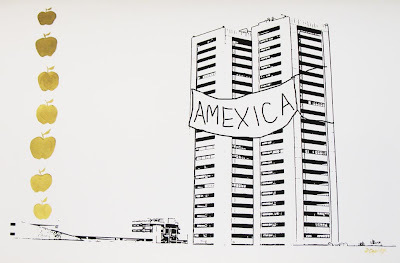 It is a documentation of those who are changing American life influenced by the ideas of transculturalism and transnationalism that exist in the American and Mexican landscape. 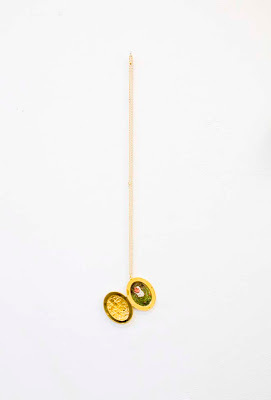 These pieces are from my series on the migrant workers from Lynd's Apple Farm. 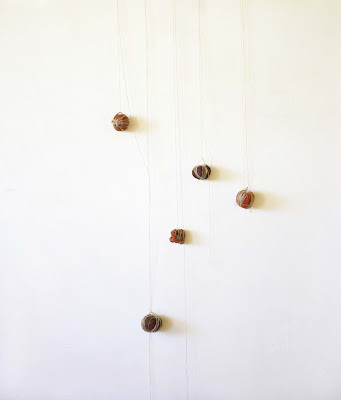 The decomposed apples hanging from strings are actual apples given to me from migrant workers in the orchards where I was documenting their work. I feel these particular apples are worth more than they are perceived in daily life. They should be treasured and admired for the hard work that was put into acquiring them from the trees and placing them at the public's fingertips. They should be a reminder of the labor value that we place on agricultural workers. They should be a reminder of your own consumer ethics. 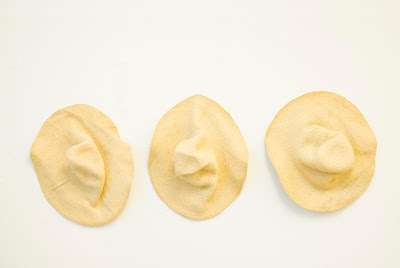 To think about where the food you eat comes from with every bite. This photo is a visual example of the 'American' lifestyle that so many migrants choose to lead once returning to Mexico. 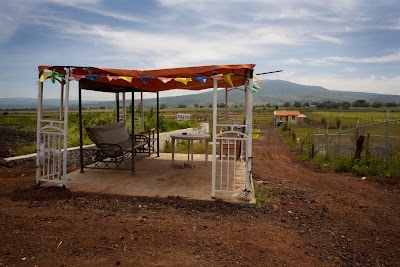 While driving toward Morelia I saw this patio set for sale at the end of a long driveway. It was near the road and caught my attention because nothing else was around for miles, and the bright colored flags lining the rim of the tent were swaying heavily in the wind. I pulled over to get a closer look. It was an older looking glider and small table for sale. It struck as another example of the way migrant workers bring back with them not only their own culture, but pieces of American culture as well. 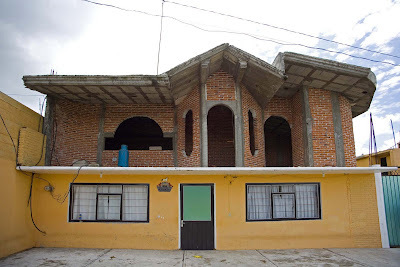 The older, more traditional style of architecture of Mexican homes don't have porches or a patio in the back for the patio glider. 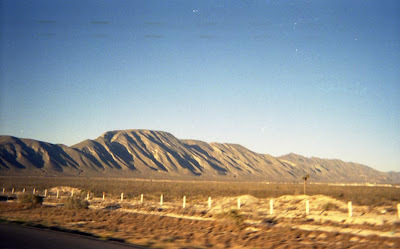 The landscape of Mexico is visually stunning. There is a mixture of old and new in the architecture that is fascinating. However, it is becoming more homogenous with the increased usage of American influenced architectural design elements. These elements that are added to the new homes being contructed with remittances from migrant workers are designed to bring pleasure to the eye, but are hardly practical. At times, for example, there are driveways built simply for the illusion of having a driveway. It is not functional but it is there. 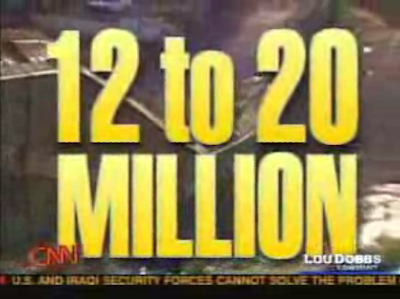 There is also an increase in the idea of personal landscaping. THe upkeep of one's yard so that it is presentable or comparable to your neighbor's yard. There is pride in having a perfectly trimmed bush or a blooming flower garden, but in Mexico most homes have been built behind walls so these added elements for curb appeal become redundant. 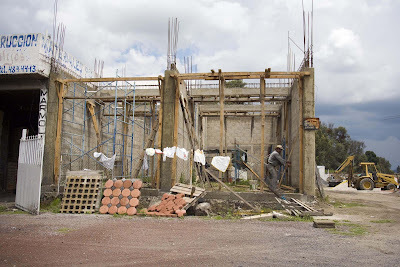 While travelling in Mexico I became accustomed to seeing skeletons of homes being constructed everywhere I looked. I wondered who was building them and why they looked as if they were taking so long to be completed. 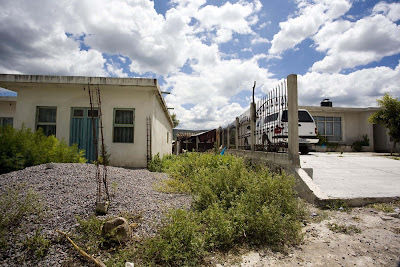 I soon discovered that these homes were the homes of migrant workers away in the U.S. They took so long to construct because whenever they could they would send money back for pieces of the construction to be complete at a time, the did. The idea of having money to build a house is one reason why so many workers travel north looking for work. 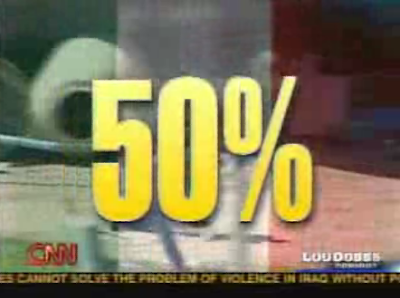 In the Mexican economy there is no room for loans or borrowing. if you are not rich or inherit a home chances of you building one are very slim. Many of the people I spoke to wanted to work in the U.S. specifically to save money for a home for their family. While in the pueblas, one can easily discern which families are receiving remittances and which are not. It becomes obvious when you look at the homes. 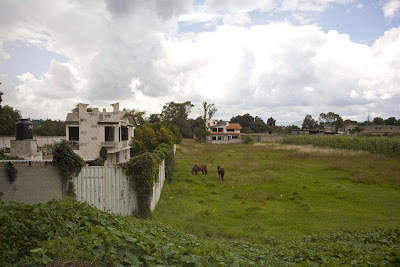 Inevitably, a newer home is from the money of a migrant worker. 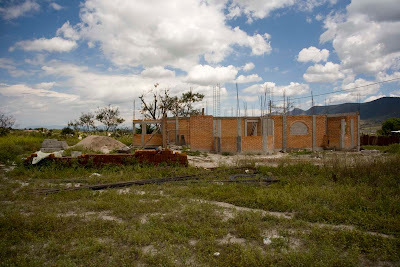 Also the construction of alot of the homes inside the pueblas begins with the addition of another story. This story is built directly on top of the older ground story. 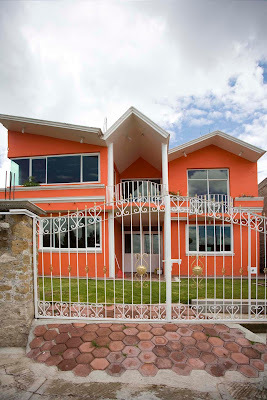 The materials used, the architectual style and design elements are all different from the previous, indigenous design. There is no attempt to create cohesiveness, only to make it bigger and therefore, better. This is the family of Eduardo. 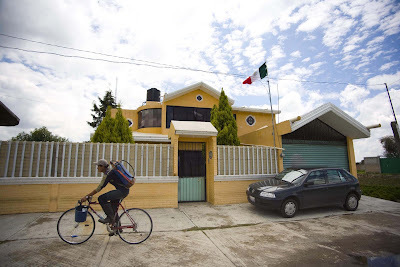 He lives in a very small town outside of Tlaxcala in the state of Mexico City, D.F. He was a migrant worker who worked in the agricultural industry of Ohio and other states. He moved back to Mexico to be closer to his extended family. He owns a greenhouse and is working on setting up a bigger one with a friend of his. 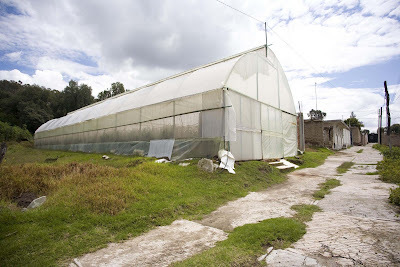 He learned about greenhouses while working with famers and other migrant workers in the U.S. It was a struggle for Eduardo to make it to the U.S. at first. He had to hire a coyote, swim the Rio Grande and survive a 5 day trek through the desert. Once he was working he made enough money to send back to his wife so that he could construct the greenhouse he has now. He also opened a store that sells paper and other school supplies. His wife runs this business. The family is pictured in front of this business. 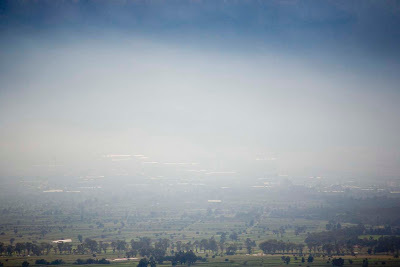 The landscape of Mexico is changing. The physicality of U.S. influence can be seen here in the use of greenhouses. This technology and knowledge was brought to the small towns by migrant workers from the U.S. After learning on the job, the workers return with this knowledge and share it with their communities. Greenhouses now line the countrysides. From the mountains to the plains, everywhere in the distance you will notice the long, white structures. They are helping to bring work back to towns where the agricultural industry is suffering. 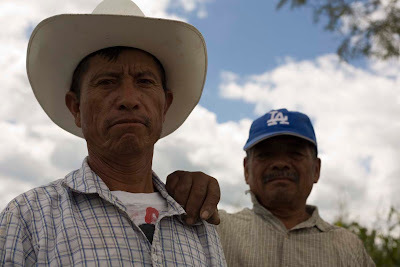 In the puebla of San Miguel Aquamente nearly half the population leaves every year, 800 people, to find work in the U.S. During my visit I met these two men who were walking down the road. They were the first men I had seen there all day. I stopped them to ask about the town and if they had ever been to the U.S. Miguel laughed and pointed to is baseball cap that he was wearing. He said that of course he has been there. He had worked there for several years in California. He moved around to various professions but enjoyed the food industry the best. He worked in a friend's taqueria just outside of L.A. Juan also worked in the U.S. for a short time. He got injured while working constuction and had to return to Mexico. Both men would like to go back to the U.S. because they feel there is no work for them in their town. They also want to build houses for their families. 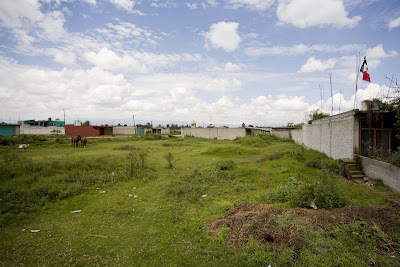 These photos represent a large segment of the varied Mexican landscape. 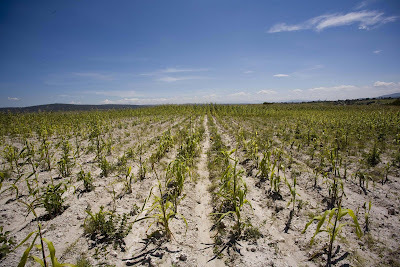 This field of corn on the outskirts of San Miguel Aquamente is struggling, as Efrain, a soil scientist at the local univeristy pointed out. He points to the untamed land and picks up large rocks to demonstrate the condition of this field. It has been extemely neglected and will produce very little corn this year. The reason is that in San Miguel Aquamente, a town with population 1600, nearly half the population (around 800 people) leave every year to go to the U.S. Therefore, the young, able-bodied men are all working in the U.S. and are not there to toil in the fields. 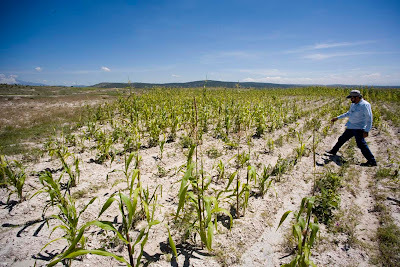 This leaves San Miguel Aquamente in a situation that most small pueblas in Mexico are facing currently. The local agriculutral industry is fading away because there is no one left in the towns to work in the fields to make a successful crop. However, due to the failure to produce crops, there are no jobs available in agriculture for the young men to even find work. 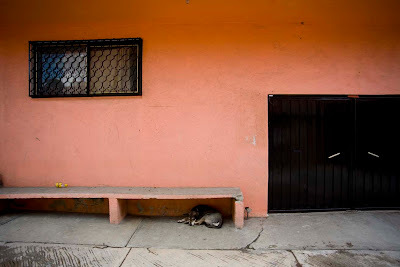 This cycle continuously perpetuates itself in small towns in every state in Mexico. This photo is particularly interesting. 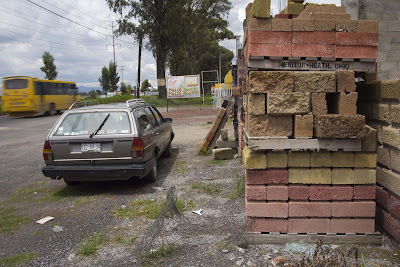 I was stopping for gas on the side of the road outside of a small puebla near the state of Michoacan. There I noticed these large slabs of bricks. When I approached them and read what was written on the palettes, I was surprised to see that these bricks were shipped from Heath, Ohio. We have a large clay deposite in that part of the state therefore Ohio is a large producers of bricks. How interesting that the bricks being used in the construction of the new structure above are from Ohio. It represents the argument that the money that migrant workers make in the United States and send back to Mexico (remittances) seems to find itself being spent on U.S. goods or services. This phenomena is partly due to the economy becoming increasingly globalized, and partly due to the North American Free Trade Agreement (NAFTA). NAFTA has opened up the Mexican economy to become bombarbed with cheap American products including bricks, rice and corn. With prices far below market value in Mexico, these are the goods that the people then choose to purchase. In return, there is a loss of industry and jobs. 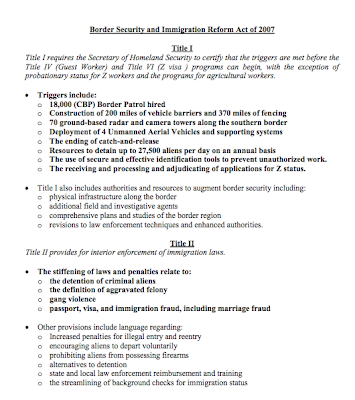 Requiring an increased migration north and into the U.S. 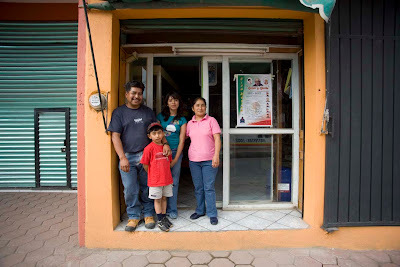 These images are of a type of Mexican UDF or 7-11 on the right and a traditional taqueria type restaurant on the left. 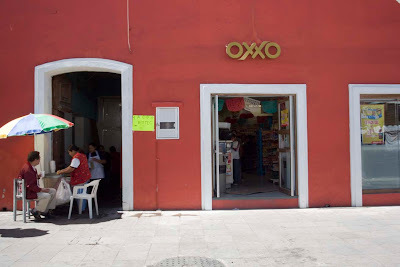 Oxxo is a chain convenient mart that sells everything from biggie pops to batteries to tequila. 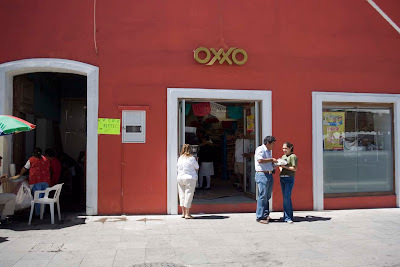 The man who owns this particular store located in Tlaxcla was a former migrant worker orginally from Mexico City. He worked in California in the agiculture and construction industries. 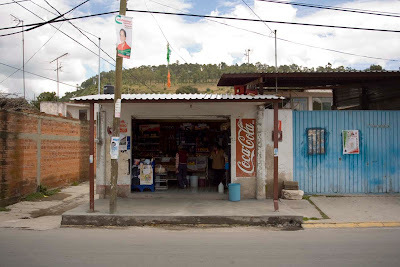 He liked certain aspects of the United States so much that he decided when he came back to Mexico the final time that he would open his own convenient mart. His entire family now works there with him. He is happy he is back in Mexico now. His store does very well. He is near is family and enjoys his culture. Ironically enough, sometimes he misses the coveniences of the United States. When the media (news outlets ie. Fox News, CNN) portray migrant workers as the new terrorists it becomes reminiscent of how they used to portray them as the drug lords smuggling drugs into our country at every opportunity during the Regan administration and through the Clinton administration. It is a way of justifying the increased use of militarization on the border and creating an unjustified frenzy among the people of the United States. They do this by utilizing the colors on the terror threat color chart we have all become so accustomed to seeing. 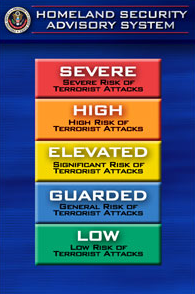 The yellow stands for 'Elevated' and the 'significant risk of terrorist attacks'. 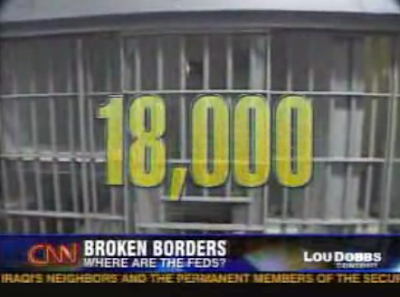 This is the color the media uses when it runs stories about migrant workers. They use very large yellow font in an attempt to create a connection with the 'Elevated' risk factor and migrants from Mexico. Labels: this is how our migrant workers get labeled in media..